The Bermuda FEI World Dressage Challenge took place at the National Equestrian Center on Vesey Street. Judges in Bermuda were Mercedes Campdera from Mexico and Brenda Minor from Canada. 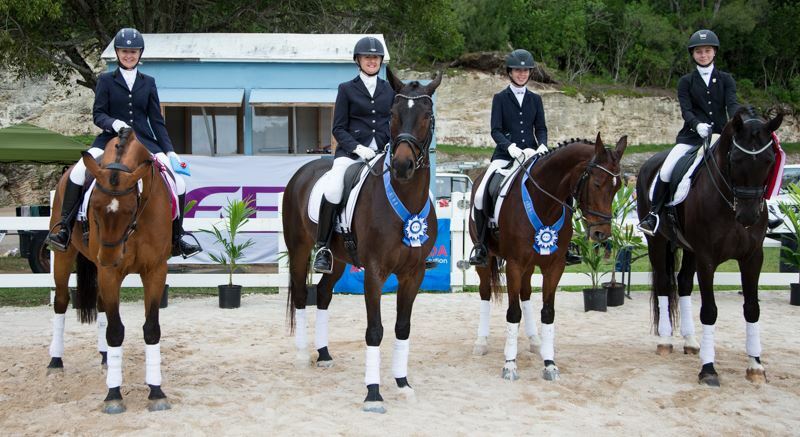 Bermuda’s Declared Team Classification is as follows, Angela Holloran-Smith and Finnomenal AV with a score of 70.303%, Robin Stempel and Rossano Royal 2 scoring 61.515%, Claire Turner and Landtango who scored 61.79% and Kelsey Amos riding Wiratoro scored 68.27%. Holloran-Smith riding Finnomenal AV won the Senior II Class with a score of 70.303%, with Robin Stempel and Rossano Royal 2 finishing second with a score of 61.515%. During the Senior 1 Class, Virginia McKey and Matinee finished with the top score of 66.607%, Claire Turner and Landtango finished second with 61.786% and Rebecca Bartoletti and Finnomenal AV finished third with a score of 60.893%. Kelsey Amos won the Youth Class riding Wiratoro they clocked a score of 68.269%.